Sura Hagia Sophia Hotel at the best location in Istanbul, walking distance to all the important places in Sultanahmet. Start your travel on our hotel to explore the Historical Peninsula. 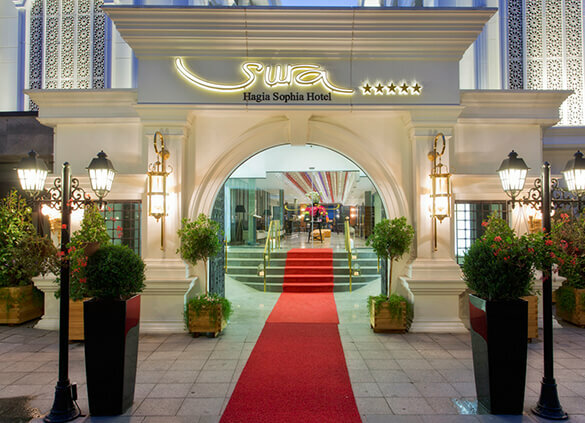 Make the best of your Istanbul hotel visit in deluxe rooms of Sura Hagia Sophia Hotel & Spa. In our budget-friendly deluxe rooms, you will feel the comfort better when you make correct Istanbul hotel option. This 262 ft² spacious suite comes with a patio where you can enjoy your coffee after a busy day in the city. Sura Hotels's family rooms have two separate rooms connected with a door and they offer you the comfort of your home. Featuring views of Istanbul, the garden or the pool, this double / twin room offers many amenities for your comfort. You will have unforgettable moments in Hasbahce where you can host dozens of people every season. Enjoy fun moments while sharing fruit platter, fruit juice or coffee with friends at the poolside. We invite you to embark on our historical voyage and experience the exclusive delight of a menu.